Aviation of Japan 日本の航空史: New Limited Edition Ki-10 Decals! 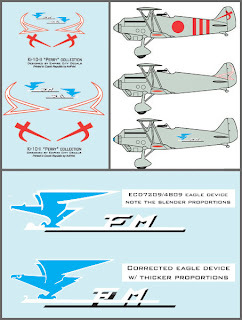 In close collaboration with Ken Glass, Empire City Decals (ECD) has produced a unique set of decals available in both 1/72nd and 1/48th scales for the Kawasaki Ki-10-II under the new JNAF/JAAF Research logo. 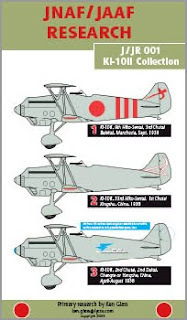 The unit markings for three aircraft include a correctly proportioned fuselage eagle motif for the 2nd Chutai of the 2nd Hiko Daitai in China, 1938. The decals have been reproduced by Draw Decal as a very limited release available solely from Ken Glass but ECD will have a small number for sale at the IPMS-USA Nats in Columbus, OH, USA. The other markings on this sheet include the tail insignia for the 1st Chutai of the 33rd Hiko Sentai in China and the tail insignia for an aircraft of the 3rd Chutai, 9th Hiko Sentai. All three aircraft are in the overall hairyokushoku (grey green) colour scheme. 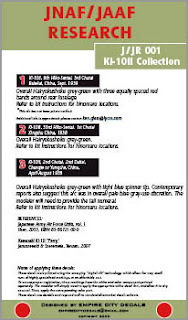 Please note that the sheet does not include Hinomaru which must come from the kit to be used. Recent 1/72nd kits of this enigmatic JAAF biplane fighter include a mainstream injection molded kit available from ICM and a limited edition kit available from Avis. In 1/48th there is the superb kit by Fine Molds, available in three versions.